A great deal has been written about insecure romantic love in recent years: the desperate longing many people feel for an intimate connection, the repeated and often futile efforts to find that connection, the emotional turmoil and jealousy that occur along the way, or the painful experience of depression that may follow. What we haven’t seen are reliable explanations about how and why this happens, what early experiences contribute to creating someone prone to insecure romantic love, and what other personality traits this person is likely to display. Six centuries before Christ, the Greeks called it “theia mania,” meaning “the madness from the gods.” The poet Sappho described this condition as an overwhelming desire to be in a loved one’s presence, to make physical contact, to be approved of and cared for, and to possess and be fulfilled by another. Theia mania had symptoms familiar to us today: agitation, sleeplessness, fever, loss of appetite, and heartache. Almost two thousand years later, the word mania returns to the literature in the words of sociologist John Lee, who described the manic lover as “consumed by thoughts of the beloved,” with an “insatiable” need for attention and affection. Lee noted that “the slightest lack of enthusiasm from the partner brings anxiety and pain; each tiny sign of warmth brings instant relief, but no lasting satisfaction.” Our notion of insecure love is similar to what Dorothy Tennov, in her book Love and Limerence, labeled limerence-a state of continually or repeatedly being “in love” as opposed to loving. Some related experiences of insecure love are the insane jealousy that rages within you regardless of whether your partner is actually unfaithful, or the agonizing, cataclysmic, and often vindictive breakup and aftermath when it feels as if the core of your being has been taken away. Extreme jealousy that intensifies as the relationship unravels and depression after the relationship ends are par for the course with insecure love. “Love hurts,” sang the Everly Brothers-but why does it hurt some of us more than others? What leads some to search for love in a self-defeating way that sets them up to be hurt again and again? What makes otherwise accomplished, confident people anxious, fearful, and insecure in their romantic involvements? Do they repeatedly choose the wrong person to fall in love with? Do childhood experiences hold the key? Can understanding lead to change and growth? Secure, anxiously attached, and detached are the three habitual approaches to adult romantic love: The tempestuous experience of insecure love, also referred to as "anxious romantic attachment," has two main components. The first is anxiety. This is the “he loves me, he loves me not” sensation of being kept constantly on edge by a fickle lover. Anxious lovers feel as volatile as the stock market-up one day, down the next. Their passion rages all the more intensely when they are least sure that it’s reciprocated. The second component of insecure love is obsession with the loved one. Signs of romantic obsession are love at first sight, longing to see the loved one every day, or wanting to go off and live on a deserted island together. To the obsessed lover, the possibility of rejection feels like the end of the world. A person who experiences romantic insecurity tends to be both anxious and obsessed. Everyone feels these emotions sometimes, but the person who is insecure in love feels them intensely and often goes quickly from one extreme to the other. There is another side to insecure love. Some people always seem to be between relationships, passing up the highs of romance to avoid risking the lows of rejection. While this detachment looks very different from anxiety, it may, in fact, be closely related. Those who avoid romantic involvements may be anxious, too-so much so that they prefer not to expose themselves to experiences that might arouse their anxiety. A person’s choice of partners also reveals something about the kinds of relationships that person seeks. An inconsistent partner can make you feel anxious; conversely, feelings of anxiety can lead you to perceive your partner as inconsistent and even provoke your partner to act inconsistently. Then, in a vicious cycle, you end up feeling more anxious. Either way, information about your partner can provide useful insight into your insecure relationship. When the insecure lover has invested more emotionally in the relationship and has more to lose, insecure love can show itself as jealousy. Many people at one time or another have been either on the giving or receiving end of intense jealousy. The aura of romance and excitement of infatuation, not to mention trust and mutual respect, can be shattered by the destructive symptoms of romantic insecurity. When the relationship ends, it is usually the insecure lover who’s jilted. Feelings of hollowness, as if the core of one’s being has been cut out, are signs of depression, and, like jealousy, are commonly found in those who earlier manifested feelings, thoughts, and behaviors of insecure love. 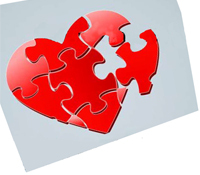 Anxious attachment (or detachment), jealousy, and depression are all pieces of the jigsaw puzzle of insecure love. Although research has confirmed many features of insecure love, its most important revelations illuminate the kinds of prior family relationships that contribute to an individual’s susceptibility to insecure love as an adult. A person is, in varying degrees, more likely to feel insecure in love if one or both parents are rejecting, indifferent, or inconsistent in their demonstrations of affection. There is a clear contrast between parents who are remote disciplinarians and those who establish a warm, nurturing relationship with their child, and parents who provide a model of an emotionally secure relationship can help a child avoid anxious attachments. The emotional relationships you form as an adult cannot, of course, be explained completely by the way your mother treated you as an infant. On the contrary, as you grew up you experienced many different kinds of attachments that may have played a part in your learning to feel secure or insecure in your connections with people. People habitually insecure in love relationships would say they are looking for acceptance, nurturance, and unconditional love, yet they typically repeat destructive patterns, re-experiencing rejection and their struggle against it. This sounds like such a painful way of living-why would someone choose it? Perhaps the struggle that begun in infancy or childhood is so familiar that it’s easier than the riskier alternatives. When fearing the worst, people often seek evidence to support their fears, confirming their negative view of themselves and their experiences. Or maybe there’s some promise of ultimate resolution and mastery that the never-ending struggle falsely holds out. No matter the reason, therapy can help by bringing the sources of self-defeating behavior to conscious understanding and mastery. People can experience insecure romantic love in more than one way. Those insecure about romantic attachments have past experiences in childhood or in romantic involvements that have led them to fear rejection intensely. To cope with their fear, they adopt different strategies depending on what has worked for them in the past. Some try to reduce their anxiety by increasing the security they feel in their relationships. These are the anxiously attached individuals. They cling to their partners or declare their passion in dramatic terms in an effort to elicit a reciprocal commitment. Others cope with insecurity in the opposite way by acting detached and self-sufficient in their relationships, or even turning away from romance altogether. They avoid the large risks of emotional involvement by not getting involved. Both approaches seek to reduce uncertainty. People who appear detached often have as much desire for intimacy as anyone else. They may yearn for closeness, but fear exposing themselves to possible loss and its resulting grief and despair. Although they may have a great deal to offer in love relationships, they are afraid to show their true warmth. Greater awareness of the roots of detachment may give such individuals the insight needed to venture the risks and rewards of love. For example, a person who was not well cared for as a child may not understand how to care for others. That person’s partner may in turn feel insecure because the affection he or she shows is not reciprocated openly by the detached person. Detachment is especially common among men and can be a source of frustration for the woman who wants an emotionally available partner. It can also be a less easily identifiable source of frustration for the man engaged in an endless pursuit of achievement, power, and recognition in place of intimacy. Many men, and increasingly, women, substitute outward accomplishment and the admiration of others for the satisfaction of the basic human need to form close relationships. Since this deeper need for intimacy remains unrecognized and unsatisfied, the quest is likely to prove futile, whatever gratifications it provides along the way. Too much anxiety is obviously disabling. Too little, however, can make individuals insufficiently motivated to make contact and adjust to another person’s wishes or insufficiently concerned about themselves or their partner. Similarly, some degree of attachment is essential in a mature, committed love relationship. It’s reasonable to think often about a loved one and to feel bound to that person’s fate, but not to be so driven by obsessive fantasies or dependency as to be incapable of living life independently. A person who feels some degree of romantic anxiety and obsession but keeps these feelings in balance is more capable of forming enduring, satisfying love relationships. Romantic anxiety and romantic obsession tend to go together, and more often than not, people experience similar degrees of both. This is not always the case, however, as some people are very anxious but not very obsessed, or very obsessed but not anxious. Everyone has different ways of handling anxiety and attachment, and many different personal styles can be part of a satisfying life, provided that a person maintains some balance and perspective. You probably know people who exhibit endearing idiosyncrasies in their relationships suggesting either excessive anxiety or obsessive attachment, but who clearly have a loving marriage and family life. You might find yourself Obsessed-Nonanxious if you are somewhat romantically obsessed and yet you don’t feel much anxiety because you are an emotionally secure person with a consistently loving partner. Some people are blessed with partners who are equally obsessed with them! As well-matched couples, they can have healthy relationships if their mutual obsession is not so extreme that it cuts them off from the rest of the world. Likewise, Nonobsessed-Nonanxious people are undemonstrative, even matter-of-fact about their love, but their love can still be genuine and mutual. Nonetheless, a study in which participants rated their four most important love relationships revealed that those scoring lowest on attachment (and perhaps also on anxiety) may be detached to a degree that denies them or their partners the satisfactions of intimacy and emotional security. People have different degrees of awareness of their own detachment. Some may consciously long for intimacy but are afraid to reveal such wishes to others. By not acting on their desires they avoid rejection and disappointment, yet remain painfully aware that something very important is lacking in their lives. How can they avoid that awareness? By suppressing the wish altogether. If you don’t know you desire love, you won’t miss it. At its most extreme, insecure love can take troubling and sometimes destructive forms. A maladaptive way of being Obsessed-Nonanxious is to have intense feelings of attachment to a relationship that is very distant or even a fantasy. Two people who live far apart may say they are in love, but never test their relationship with the demands of frequent contact. Or someone might carry a torch for a deceased spouse or an ex-lover he hasn’t seen in years. To love someone who is not in a position to reject you is to choose the predictability of fantasy. Some Nonobsessed-Nonanxious individuals may have been so wounded as children by insensitive care that they now are largely incapable of normal relationships. Unable to trust even their parents to take care of them, they seek to protect themselves by obtaining what they feel they must have for survival, even if they end up hurting others along the way. These individuals, often labeled as having “psychopathic” or “antisocial” personalities, are capable of great deception and sometimes commit criminal acts without remorse. They treat people, including lovers, as property to be stolen, exploited, and abandoned at will. Lacking the usual experiences of human attachment and vulnerability, they feel little or no anxiety or love. They may form what appear to be strong attachments, but these are mainly with people who feed their egos. As long as you’re loyal, they’ll love you and the relationship will seem close and warm, but they won’t appreciate you as an individual, only as an extension of themselves. If you challenge or appear to betray them, they’ll turn on you. This pattern of low or absent anxiety and obsession is somewhat more common among men than women. A more typical form of fluctuating detachment is experienced by many people. These individuals want relationships of mutuality, but are emotionally self-protective because they were hurt in childhood or in previous relationships. They avoid romantic attachments to spare themselves the pain and anxiety arising from the anticipation or actuality of rejection and disappointment. Since they experience considerable anxiety about relationships, one might expect to find them among the Nonobsessed-Anxious. These people stay out of romantic relationships or characterize their relationships as nonromantic so that they won’t have to feel anxious. They may not feel much anxiety as long as they refuse to acknowledge that a particular relationship is important. People who fear involvement may require more reassurance before they allow themselves to commit. Once they let their defenses down, however, they’re very vulnerable to romantic obsession as well as romantic anxiety-feelings sometimes expressed only after the relationship ends. A person like this may flip back and forth, periodically venturing into the dangerous territory of anxious romantic attachment and then scurrying back to the refuge of detachment when a relationship doesn’t work out. Detachment can be challenging for a therapist to treat, since a detached person, while appearing outwardly cooperative, typically resists disclosing his or her feelings. A person who avoids emotional relationships is likely to have difficulty forming (or acknowledging) a therapeutic relationship as well. One role of the therapist is to draw such individuals out (with adequate assurance of safety) into an openness they’ll learn to enjoy and wish to replicate in their own life. If nothing else, therapy can allow them to experience a less detached relationship than they’re accustomed to, an experience that desensitizes and encourages the person to take further steps. Even without therapy, people’s lives are not static. Growth can occur through fortuitous circumstances as well as personal resolve. Dr. Carl G. Hindy has been a doctoral level clinical psychologist for over 25 years and has a private practice in Nashua, NH. Hindy provides marriage counseling and individual psychotherapy in New Hampshire, consults and writes on relationship topics, and mentors other counselors. He is the co-author of the book If This Is Love, Why Do I Feel So Insecure? For more information, go to www.hindyassociates.com. "If This Is Love, Why Do I Feel So Insecure?" Learn more about his approach to couples counseling in the book! Ask About: "If This Is Love, Why Do I Feel So Insecure?" Copyright 1995-2019 Carl G. Hindy, Ph.D.